Montreal, March 21, 2017 — PROJET PANGÉE is pleased to present Period Pieces: A Sunset Terrace Retrospective. Period Pieces: A Sunset Terrace Retrospective is the first collective exhibition from Sunset Terrace, an artist-run gallery and studio in Vancouver. 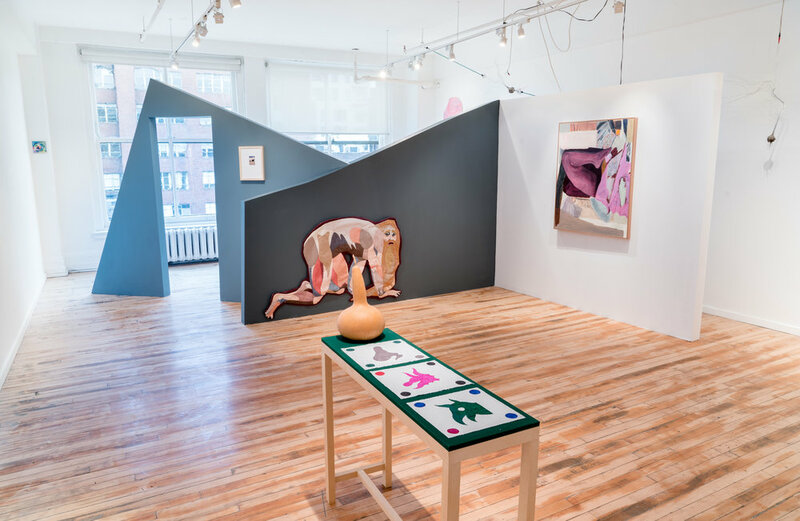 The show brings together new work from fifteen artists who worked alongside one another operating and maintaining the gallery, as well as building individual and collaborative studio practices under the same roof. Although many of the artists now live in different cities, they maintain a deep interest and investment in each other’s work, knowing the paths and trajectories that brought them to their current ideas. This exhibition is an opportunity to see their current work through the lens of a formative community, letting artworks get reacquainted with their old neighbours and celebrating the places where ideas grow, diverge and overlap. Sunset Terrace emerged in 2013 within a network of artist-run spaces in Vancouver, beginning as an experiment in pooling resources and an expression of art school friendships. Gallery shows alternated between artists from the space and artists from the wider community, with the studio tenants on hand to assist the exhibiting artists in realizing their vision. The exhibition at Projet Pangée exists as a form of reunion for a collection of studio practices who once shared a home. Their grouping is a snapshot of a moment in Vancouver, but their current form encompasses an array of cities, schools and influences. The artists came from across Canada, were united in Vancouver, have dispersed around the world, and will now be assembled for a brief but exciting moment in Montreal. Though only fifteen artists are featured in the exhibition, Sunset Terrace would like to acknowledge all those who have exhibited, rented, or otherwise contributed time and energy to the project. Graham Landin is an artist living and working in Vancouver, Canada. As a liaison between art and architecture, Landin's work looks to a curatorial space as a site for art production. He earned his BFA from Emily Carr University and has since exhibited in Vancouver, New York and Los Angeles. His work has appeared in The Editorial Magazine, Canadian Art Magazine and ARS. He is a founding member of Sunset Terrace, and was the recipient of the Chancellor's Award for Excellence in Painting. Artists: Maya Beaudry, Viktor Brienstensky, John Burgess, Simone Jarvis, Emma Lamorte, Graham Landin, Benjamin Marvin, Soledad Muñoz, Chad Murray, Katrina Niebergal, Ryley O’Byrne, Tess Rafael, Adam Shiu Yang Shaw, Mitch Speed and Tristan Unrau.